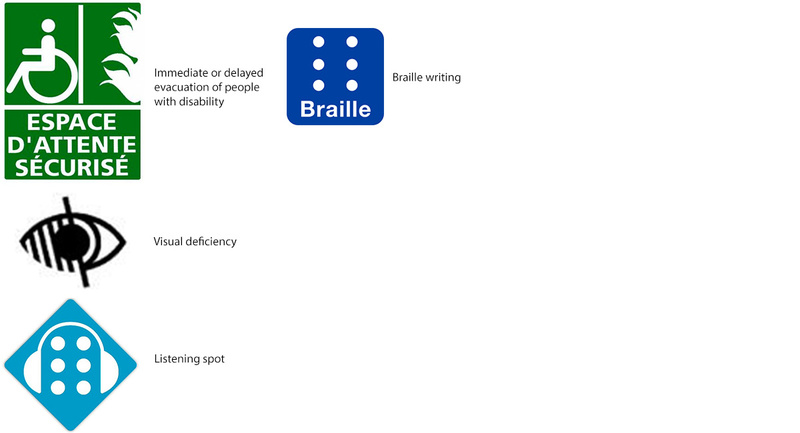 All forms of disability are moving, whether visual, auditory, physical, mental or psychological. 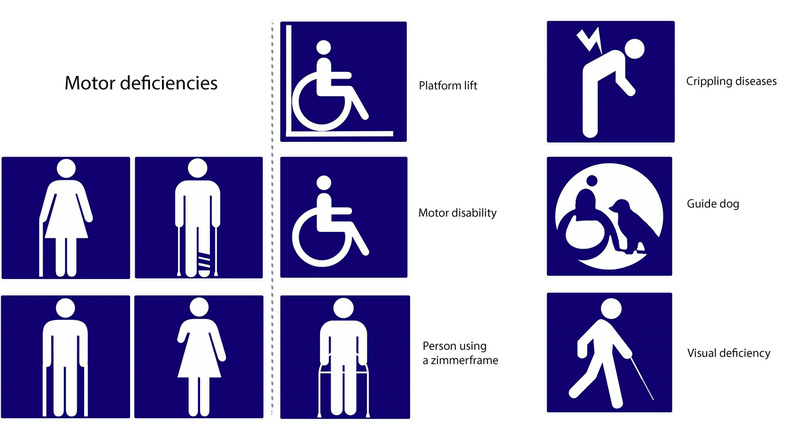 To properly identify facilities and establishments equipped for people with disabilities, see the different pictograms below along with their meaning. Mallemort’s Disability Charter intends to promote the integration of people living with disabilities within our town (mental, physical, psychological, hearing, visual) to improve their independence through concerted efforts between the town, partner associations and the population. The charter strives to find the balance between the disabled person’s desire “to exist” and the “experience” of the city, associations and everyone concerned. 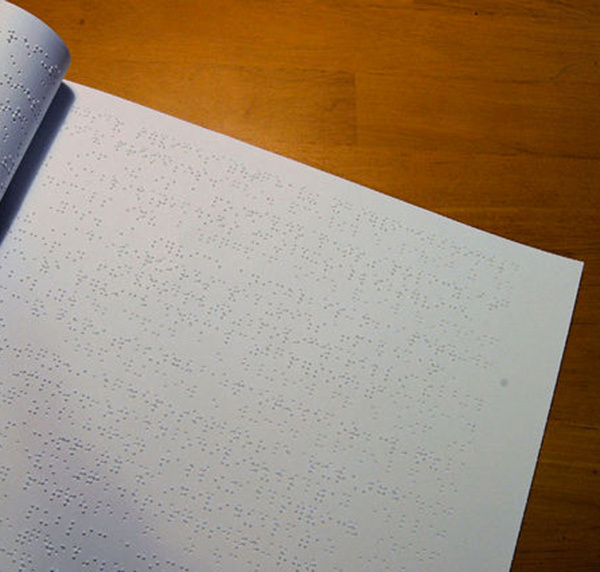 This document goes beyond regulatory requirements to formalize the collective commitment of the municipality, associations and social partners, offering the disabled their rightful place within our city by taking the appropriate measures in all areas of daily life: information, mobility and transport, access to public spaces, employment, housing, childhood education, culture-sports-hobbies-holidays, home life and social life. It will communicate via action sheets describing existing or future projects offered by the Committee or any that have already been initiated. The charter claims to be an accurate reflection of widespread, shared concerns. The extra-municipal Committee’s approach marks a political desire to integrate people with disabilities, to examine and discover innovative actions and complementary services that respect people’s rights and that can improve as much as possible not only disabled peoples’ skills, but also their environment, adapting it so they are able to participate in the same way as other citizens. Human Rights for all without discrimination! The term disability refers to a person’s incapacity to live and act in his/her environment because of physical, mental or sensory deficiencies. In most case the disability manifests itself through mobility, speech or understanding difficulties for the person affected. By 1980, the term Handicap was already associated with individuals unable to secure a normal role and social life within society due to their disabilities. The WHO went on to include social implications so as to take environmental factors into consideration. What it really all boils down to is that a handicap situation arises because of an unsuitable environment rather than by the disability itself. This is why nowadays we talk about “people with disabilities”. The temptation to establish a typology of different disabilities is necessarily reductive, but it provides an initial insight into the different ways disability can be expressed: motor, auditory, visual, mental psychic. La tentation d’établir une typologie des différentes déficiences est forcément réductrice, mais elle permet de donner un premier éclairage sur la diversité des manifestations du handicap : moteur, auditif, visuel, mental, psychique. The MDPH is a unique public service that welcomes, informs, guides and accompanies people with disabilities. MDPHs combine all the skills required today to support people with disabilities and their families. Departmental Homes for People with Disabilities are responsible for the reception and support of disabled people and their families. 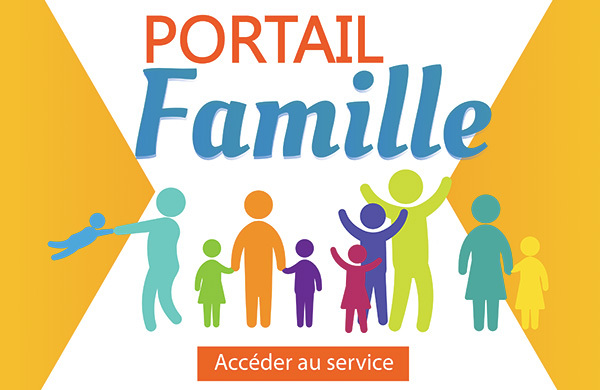 Set up and run by the General Council, they bring together: the General Council, State services, family and insurance welfare organisations (CAF, Caisse d’Allocations Maladie) and representatives from associations working with people with disabilities. They constitute a local network for access to all rights, services and benefits, whether existing or created by the Act dated 11th February 2005. This welcoming establishment is open to people with disabilities (regardless of the origin or nature of the disability, their age or place of residence), their families, professionals, associations, etc. The disabled person is always at the very heart of this public service system thanks to a genuine consideration of their life plan and a close evaluation of their needs by a multidisciplinary team, to recognise their needs through the Committee for the Rights and Autonomy of people with disabilities (known as the CDAPH). Support for people with disabilities (children or adults) and the allocation of all aid and benefits (disability card, priority card, parking facilities, etc.) including the provision of disability compensation (PCH) paid for by the General Council, is now decided by a single committee. Over and beyond any decisions concerning the allocation of aid and benefits, MDPHs have a mission to welcome, support, inform and advise the disabled and their families as soon as their disability has been declared and throughout its development. MDPHs rely on the skills of a team of medical and social professionals (doctors, nurses, social workers, occupational therapists, psychologists, etc.) to assess the needs of each person based on their life plan and to propose a personal disability compensation plan that takes into account factors such as their professional background and accessibility to work. Lastly, MDPHs work together with healthcare and medical-social systems and appoint advisors to help adults with disabilities integrate into the workforce and to help children gain access to education. The MDPH offers a number of services and support to children and adults living with disabilities. The MDPH issues the Disabled Worker’s Professional Recognition Award (the RQTH). This gives workers with disabilities and their employers the right to claim services or benefits. The MDPH issues disability and priority cards. European parking permits are issued by the Prefectures, but applications are examined and approved by the MDPH. Committees for the Rights and Autonomy of People with Disabilities (CDAPH) were created by the Act dated 11th February 2005 to ensure equal rights and opportunities, participation and citizenship for people with disabilities. They are composed of representatives from the General Council, State services and public institutions (ARS, Académie, etc. ), social welfare organisations (CAF, CPAM, etc. ), trade union organisations, parents’ and students’ associations and representatives of people with disabilities and their families, designated by representative associations and a member of the departmental Advisory Board for people with disabilities. The CDAPH makes independent choices and decisions, while the MDPH provides the required administrative services. The CDAPH makes all decisions pertaining to aid and benefits in light of assessment conducted by the multidisciplinary team set up within the MDPH (compensation requirements and development of the personal handicap compensation plan). Guiding people with disabilities and deciding on the best measures to ensure their academic, professional or social integration. Designating institutions or services that meet the requirements of the child/adolescent or that contribute to the training, education, rehabilitation or housing of adults with disabilities and also deciding on the support needed for disabled people over the age of sixty housed in specialised residential facilities. Disability compensation benefits in the form of human or technical assistance, home or vehicle adaptations, financial assistance for exceptional expenditure or pet costs. Allowance paid to people with disabilities (children and adults), taking into account their specific needs and life plan. The allowance can cover costs related to the need for personal assistance, technical assistance, home or vehicle adaptations and/or exceptional expenditure or pet assistance. Assessment and decisions to award benefits are made by the MDPH. This allowance is intended to ensure a minimum income for people with disabilities so they can cope with the cost of everyday life. It helps people with no previous professional activity or those who are not eligible for Social Security disability benefits to achieve financial independence. The Committee for the Rights and Autonomy for People with Disabilities (CDAPH) approves their rights to claim the allowance and the CAF checks administrative conditions are met before payment is made. This ensures a guaranteed income and is paid in addition to the AAH. People receiving additional resources on top of the special disability fund (FSI) can also benefit from it, provided they meet certain conditions. It is intended to offset the lack of sustainable income from employment for people with disabilities who are unable to work. It is awarded under certain conditions and by decision of the CDAPH. This allowance is paid by the General Council to adults under the age of 60. It allows people with disabilities to assume the costs of third-party assistance in basic help in everyday tasks (*third-party or staff from a healthcare facility). The ACFP allowed people acknowledged as more than 80% disabled to assume the extra costs related to the exercise of their profession. Originally, it was a social benefit paid by the General Council; today it has been replaced by the PCH. However, beneficiaries may continue to receive it instead of the PCH if they so request. A study allowance for disabled children may be granted as soon as the child is acknowledged as 50% disabled. It can be paid until the child is 20 years old. The AAEH basic amount can be supplemented by the addition of 6 supplements and a specific additional resource for single parents. The Act dated 11th February 2005 for equal rights and opportunities, participation and citizenship of people with disabilities makes its goal very clear – to educate children with disabilities. It supports the right of every child to mainstream schooling closer to home and to continuous and appropriate schooling. In this context, in collaboration with the MDPH, parents are very closely involved in the whole process, whether it concerns their child’s academic orientation, or the definition of their personal educational project (P.P.S.). Depending on the nature of the child’s disability and his/her PPS, lessons can be individual and may or may not include assistance (school supplies or appropriate transportation, presence of a classroom assistant (AVS), etc.) and amenities. Schooling for children with disabilities can also take place in a collective environment, within the framework of CLIS (school inclusion classes) in primary schools or ULIS (school inclusion special units) in secondary schools. If the nature and severity of the child’s disability so requires, he/she may have lessons in a medical-social establishment and enjoy a full-time or part-time education while receiving the appropriate educational and therapeutic support. Si votre enfant est porteur d'un handicap et qu'il a besoin d'emprunter les transports scolaires, une demande de prise en charge peut être formulée auprès du Conseil Départemental des Bouches du Rhône qui offre un service adapté. The Act of 2005 strengthened requirements concerning the obligation to offer employment to people with disabilities and has improved the situation of people with disabilities seeking access to employment by linking it to the creation of MDPHs. The principal of an obligation to employ has been implemented since the Act n°87-517 was adopted in favour of employment of people with disabilities. It requires that people with disabilities make up 6% of the total number of staff in all public and private institutions with more than 20 employees. 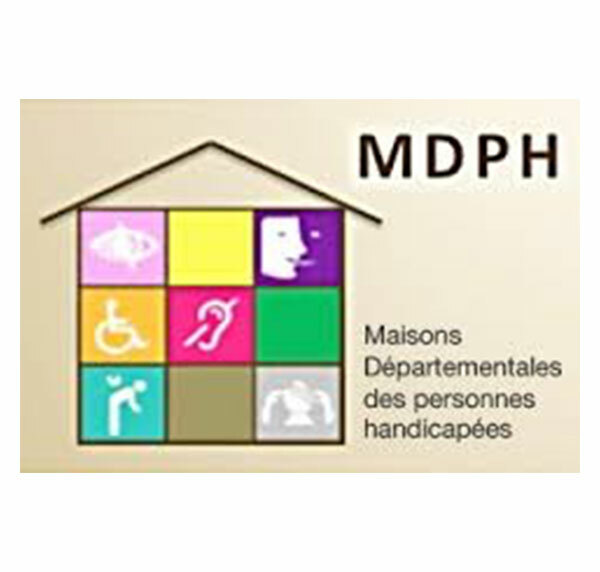 Since the Act of 2005, the two main players in the professional integration of people with disabilities are the MDPHs and the Cap Emploi network. MDPHs use the CDAPHs to deliver certificates of acknowledgement of disabled workers (RQTH) on the basis of the applicant’s assessment by a multidisciplinary team and according to his/her life plan. In the case of disability requiring a person to be admitted into a protected environment, the decision to do so is taken by the CDAPH. Previously such actions were the responsibility of Cotorep, the technical committee for professional orientation and rehabilitation. Career guidance can target the traditional employment market (public or private sector companies, government, associations, adapted companies, home-working distribution centres) or a protected environment (ESAT, formerly CAT) which are organisations that help people with disabilities get back into the workplace. Article 1 of the Act of 2005 states the creation of an advisory position to deliver career advice in every MDPH. This advisor “is responsible for relations between the departmental home and the departmental Director of Labour, Employment and Professional training in all questions relating to the professional integration of people with disabilities”. It informs and assists people with disabilities in their journey towards employment. Cap Emploi is a network of associations that have obtained certification from Agefiph. They are financed by Agefiph, Fiphfp and Pôle Emploi. Their mission involves assisting people with disabilities in their search for employment and putting job-seekers in touch with employers. This local service is available across all departments. Access to social life and full citizenship for people with disabilities is one of the goals announced by the Act of 2005. 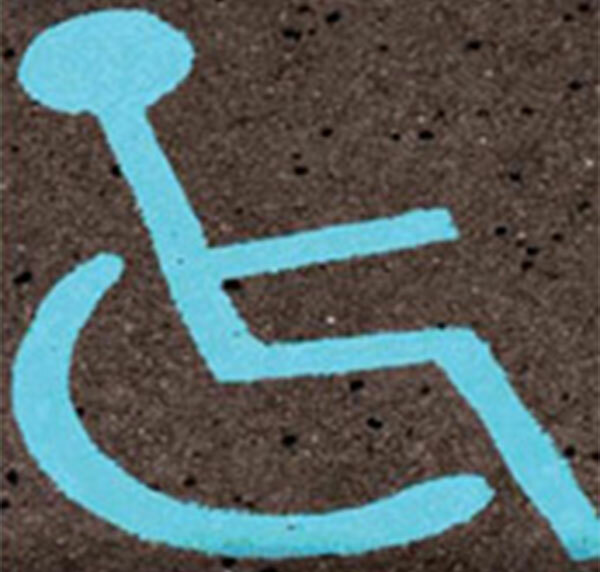 Implementation of the right to disability compensation helps achieve this by enabling the disabled person to overcome functional impairments through the provision of technical, human and financial assistance. Likewise, the personalised compensation plan that takes into account the disabled person’s life plan allows, if necessary, for access to leisure activities, culture, sport, holidays*, etc. Citizenship and social integration of people with disabilities is the subject of special section IV entitled “citizenship and participation in social life” in the Act of 2005-102 for the equality of rights and opportunities, participation and citizenship of disabled people. In terms of social inclusion, this title incorporates into law the obligation to offer people with disabilities access to the voting process. It also recognizes French Sign Language (LSF) as a separate language (Article 75), in response to a previous request issued by associations for people with hearing disabilities. 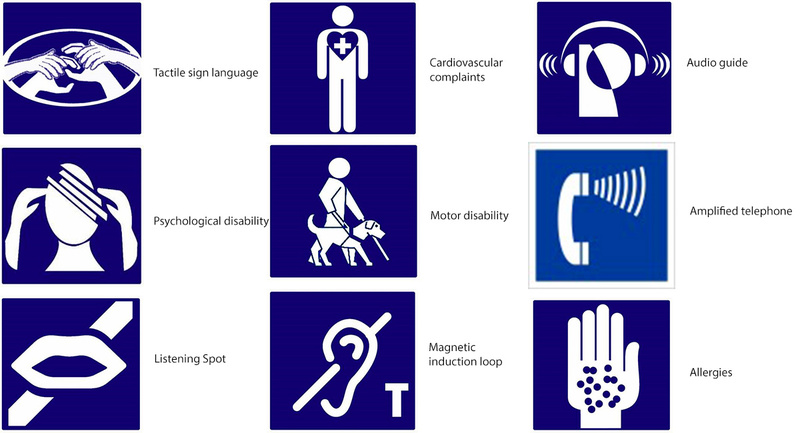 Access to public services for people with sensory handicap (hearing or visual) is facilitated by the obligation of state services, local and regional authorities and private bodies or individuals entrusted with a public service mission, to offer translation and means of understanding (written, simultaneous or visual translation for example). Accessibility to primetime media content also becomes mandatory within a period of 5 years from enactment of the Law (Article 74). An obligation by 2015 to ensure all public institutions open to the general public (shops, schools, public services, cultural and leisure facilities, etc.) and public transport networks are made accessible. All these obligations contribute to allowing people with disabilities to enjoy as full a social life as possible. Achieving this entails the development of a global policy in a bid to help people with disabilities to lead the most independent life possible. All construction and refurbishment of public buildings include disabled access. There are some real examples such as access to the Croix Rousse Theatre. Numerous facilities have been implemented in the streets by the Town Hall of Lyon and Grand Lyon. At the same time, Sytral develops accessibility to public transport. A solid plan for accessibility has been implemented with a quantitative and qualitative approach, allowing for the creation of 123 extra spaces and accessibility to a further 121 spaces in two years. In addition to ongoing efforts for physical accessibility, the city of Lyon also wishes to encourage a spirit of full participation in all areas of life for people with disabilities. Take measures at each election to ensure voting rights for people with disabilities are respected. Access to facilities during refurbishments and increased funding for classroom assistants to help children on a daily basis. This means it’s easier for people with visual and hearing disabilities to visit museums or to attend shows under the best possible conditions.While progress has been made in these areas, it is clear that much remains to be done. On that subject, the municipality, convinced it needs to work with the appropriate associations, has set up a strong partnership with associations for people with disabilities, developing their participation in the accessibility committee outside the scope of the town. The audit-accessibilite.com website from Medialis provides free access to information concerning the regulatory framework relating to accessibility of people with disabilities in public spaces, transport, housing and other buildings. You will also find news about accessibility, a calendar of major events, technical information (access to shops, voting, etc.) and links to the main web resources available. and by appointment to meet the social worker specialising in disabilities. Open Monday and Thursday from 8:30 to 12:00 am and Tuesday from 1:30 to 5:00 pm. Open to the public Mondays, Tuesday mornings, Fridays from 8:45 to 12:15 am and from 1:30 to 5:00 pm. It can also intervene to arrange for home help for families. Pays the compensatory allowance awarded by the MDPH to people with disabilities who meet certain eligibility requirements and funds specialist accommodation for people with disabilities. In both cases, applications are to be submitted to the CCAS. The SDPH can provide technical and financial assistance for the fulfilment of an associative project concerning access of people with disabilities to leisure, sports or cultural facilities. Open to the public Monday to Friday from 7:30 am to 4:30 pm. May grant additional assistance to cope with healthcare expenses or to help pay for equipment for people with disabilities or pensioners. Open to the public from Monday to Friday from 9:00 to 12:00 am and from 1:30 to 6:00 pm. The multidisciplinary therapeutic team from the CAMSP lends support to children under the age of 6 showing signs of mobility, sensory, emotional or intellectual difficulties or those who suffer from serious illness or disabilities. Care is free of charge for families. This organisation works with children showing signs of difficulties within their family environment to offer them educational and psychological support. Open to the public by appointment from Monday to Friday from 9:00 am to 5:00 pm. Individual support and psychological care for adults in need. Medical and social support for adults with autism.